Organizers of riots on Israel-Gaza border call for continuation of riots past original end date of May 15th. Hours after the deadliest day of rioting along the Israel-Gaza border, organizers of the so-called “March of Return” called on Gazans to continue violent clashes against Israeli security forces. Since March 30th, tens of thousands of rioters in Gaza have gathered at a dozen sites along Israel’s security fence on the Israel-Gaza frontier, hurling firebombs, rocks, and flaming tires at Israeli forces. Terrorists have also attempted to infiltrate into Israel during the riots, and placed bombs along Israel’s security perimeter. From March 30th through this past Sunday, 54 rioters – including more than a dozen terrorists affiliated with Hamas – were killed and thousands more wounded as Israeli forces opened fire to prevent mass-breaches of the border. On Monday, 59 more rioters were killed in the largest riots since the disturbances, dubbed the “March of Return by organizers”, began. 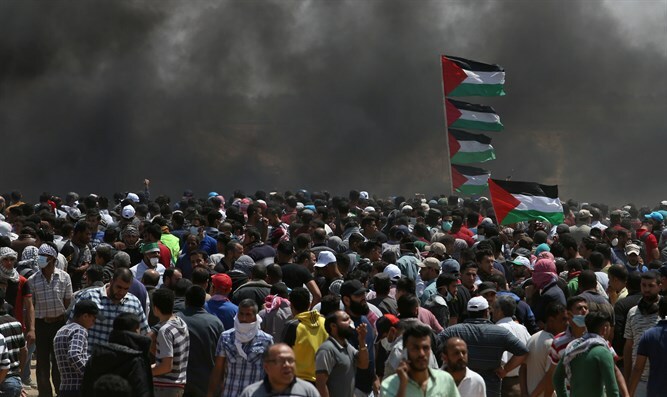 The riots were originally scheduled to conclude this Tuesday, but according to the Palestinian Authority media outlet Ma’an, the High Coordination Committee for the March of Return announced that the violent demonstrations would continue into the first week of June. “We call for the continuation of the ‘Return Marches’ on a daily basis and on Fridays,” said Islamic Jihad chief Khaled al-Batsh said in an address during a committee meeting. The committee urged “hundreds of thousands” of rioters to turn out Tuesday for yet another day of clashes with Israeli security personnel. “Seeing a crowd of hundreds of thousands marching towards the fence is a source of pride,” said Batsh.